Although the formal engagement of the United States in World War I was limited, Philly the dog reveals a Philadelphia story of that global conflict. Preserved as a historical artifact, Philly is about sixteen inches tall, and with the mount, she stands at 18.5 inches. The mount reveals that Philly was born in 1917 and died in 1932. The blue blanket that drapes her back states that she was a World War I veteran, a member of the 79th Infantry Regiment. During her fifteen-year lifespan, Philly experienced far more than a typical dog, having gone to war and returned to the Philadelphia area. She traveled to France, witnessed and aided in battle, survived gunshots and chemical warfare, had puppies, and became the official mascot for soldiers from the Philadelphia area. Philly was a stray puppy when she was found in Maryland by a soldier of the 315th Infantry Regiment who intended to give the dog to a commanding officer as a bribe, in order to avoid disciplinary action. Whether the officer took the bribe is unclear, but the 315th Infantry Regiment of the 79th Division of the American Expeditionary Forces (also known as “Philadelphia’s Own”) befriended Philly and smuggled her to France. The soldiers of “Philadelphia’s Own” found companionship in Philly, while living far from family, friends, and daily comforts of civilian life. Philly also played a significant role as a soldier. After a day in the trenches, the soldiers from North Philadelphia were resting when Philly began to bark. She warned the regiment of a sneak attack by German soldiers, saving her fellow soldiers from a potentially deadly scene and becoming a war hero. During her time in France, she was gassed and shot, and consequently she was awarded two Purple Hearts. 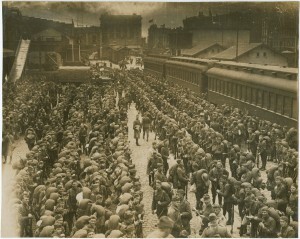 After the war, Philly went to live with Sergeant Charles J. Hermann in Philadelphia. She attended parades and regiment reunions, like other veterans, until her death in 1932. Sergeant Hermann wanted to preserve Philly, but he could not afford to take her to a taxidermist, given the economic downturn of the 1930s Depression. Instead, he buried her beneath his driveway until the 315th alumni finally exhumed her and had her mounted. Philly remained at the 79th Infantry Division’s headquarters through World War II, and then she went missing for a few years. Soldiers and veterans found her for the 315th Infantry Regiment’s fiftieth anniversary in 1967, and she remained in the battalion commander’s office until military downsizing dismantled the 315th Infantry Regiment in 1995. Before handing Philly over to the U.S. Army Center of Military History, the regiment sent her to a taxidermist to have her restored. By the time the taxidermist was finished, the 315th Infantry Regiment was gone and the archive no longer wanted her. By 1998, Philly had a new home at the Philadelphia History Museum at Atwater Kent (then known as the Atwater Kent Museum), where she gained new popularity as an artifact that reveals a story of Philadelphia’s experience with World War I. Text by Minju Bae, the 2014-2015 Allen Davis Fellow at the Philadelphia History Museum and a PhD student in the History Department of Temple University. Click on the base of the object to learn more about the war in which Philly served.